we do not remember days… we remember moments. We love this time of year, and not just because the days are longer and the weather (touch wood) gets warmer day by day…but because of the variety of colours and flowers Spring brings with it. If you follow our Instagram page you will know how much we love experimenting with flowers, mixing colours and textures and pushing the boundaries with our floral displays! We also love to bring this level of creativity into our contract work we do on a weekly basis. What can we say except…wow! We absolutely love the Knot Churros and the flower installation we have created for them! With trailing flowers that cover the ceiling and pink flower flamingos dotted around, what more could you want whilst eating a delicious churro? Our florists had a lot of fun creating this magical installation for our client! If you haven’t been already then it is worth paying a visit to Dukes Hotel in London for their completely Instagram-able flower bike installation! We love transforming venues week on week to create different looks to fit the time of year! The last few weeks have been very fresh and spring focused, incorporating Easter into our arrangements. We have been working with Claud W Dennis in Southgate for many years and last week we had the privilege of completely transforming their coffee shop for Spring. As you can see in the photos below, we turned their coffee shop into a flower power, fresh and bright space that makes them completely stand out from the crowd! Pay them a visit and see our flower wall, and of course have one of their delicious coffees whilst you’re there! Every week we provide both Nadler Hotel Kensington and Nadler Hotel Victoria with flower arrangements to brighten up the hotel spaces. As you can see, we have the ability to be really creative with our arrangements and have loved using really bright and unique flowers to create these looks for Spring! If you’re looking to freshen up your work environment for Spring and Summer then please do get in touch with us on 0208 362 1320! We’d love to help you! While summer is treating us with the best that Nature can offer – plentiful greens, wild grasses and flowers of all the colors in the rainbow we visit memory lane and one of the weddings we did last summer… nostalgic with a touch of vintage feel, yet very elegant classic whites and dusty pinks with silver foliage, strings of pearl and candle lights – it’s a wedding of childhood dreams. Our wonderful couple Isabel and Frank couldn’t have chosen a better venue for their dreamy wedding – The Chiswick House and Gardens. This Palladian villa was inspired by ancient Roman architecture and built in the seventeenth century together with breathtaking gardens which are considered to be one of the earliest examples of an English landscaped garden. Stunning garden views together with our flower arrangements reminiscent of days gone by, carried everyone away with memories of the first love, romantic long walks and dreams about The One. Once again we witnessed that combination of an amazing venue together with a brilliant team of wedding planners – Just as Planned can make any wedding vision come true. It was our pleasure to work with Mati – such a charismatic, lovely and talented young lady who knows everything there is to know about planning your special day. And of course, when your dream needs to be captured by a professional photographer – Photography by Abi is just what you need. Dream on! Happy New Year to all our flower lovers! It’s been an amazing year and we had so much fun creating such wonderful and unique flower arrangements! We had the pleasure of working at some of the most beautiful venues in England this year too – The Langham Hotel, St. Paul’s Cathedral, The Brewery, Hatfield House, Hanbury Manor, The Mayfair Hotel, The Dorchester and many more. Thank you so much to all our 2014 couples for letting us to be a part of their big day. We enjoyed every bit of it! It was such a pleasure to create flowers for Vasoula and Imran that it’s a shame they’ll be getting married just once. Vasoula was the most relaxed bride I ever met. One meeting, a few emails, and result! Vasoula wanted to have romantic wedding flowers to match the Grand Ballroom at the The Langham hotel. She chose white and blush coloured flowers with a selection of silvery foliage. We made two designs: tall vases with a loose flower ball on a top and low arrangements on glass stands. We used blush talea and avalanche roses, dahlia and white hydrangea – stunning ingredients! For the top table we arranged compact flower posies with a selection of t-lights and parfumerie bottles in between, in order to create a romantic wedding feel. After the wedding the lucky guests got to take flowers home! It was always a pleasure to work with a great wedding planning team Perrys (they always make sure we have enough coffee!) and great Greek wedding photographers team Nek Vardikos Photography Read their blog and see the wedding through the photographers lens. Summer is over and our wedding season is coming to a close. It has been an amazing year, and we had the pleasure to meet plenty of lovely couples. One of them was Gaby and Mark. 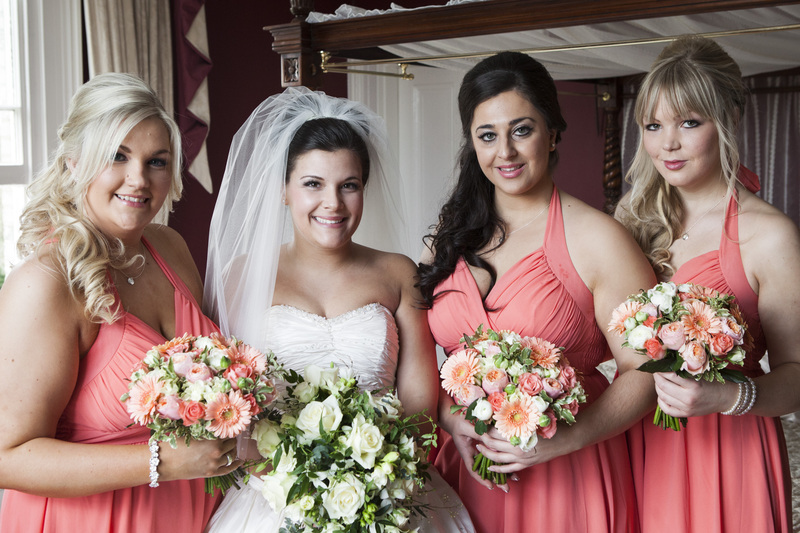 Their big day was held at the stunning venue The Longstowe Hall – 10 miles from Cambridge. Gaby had lots of great deco ideas. For example – she collected lots of bottles and sprayed them in white. We arranged them in groups around the drinks reception with cream, pink and burgundy flowers. I love a bit of Wedding DIY! Thank you so much to Lizzie and Rhoddy from Elizabeth Lois Photography for shearing their beautiful wedding pics with us. Just by glancing at these stunning pictures of Jolita’s and Andy’s wedding at Hanbury Manor Marriott Hotel you get a real sense of this year’s trends: cream & blush colour, lace & pearls, and most importantly – attention to detail! A small silver heart attached to a bridal bouquet with pictures of people you wish were there; buttonholes wrapped in satin ribbon to match the bridal flowers; top table arrangements surrounded with perfume bottles, t-lights and pearls. Small details are what make your arrangements unique. Special thank you to: Perrys The Wedding Company for arranging such a beautiful day; The Wedding Lounge – adding a special deco touch; and Photography by Adam for capturing every detail. Happy 1st Anniversary Natasha and Antony! Last year 6th of July we arranged flowers for a lovely couple Antony and Natasha. They got married in a stunning venue – The Grand Connaught Rooms. As it’s a big and impressive venue we made tall flower compositions with summer flowers like peonies, hydrangeas and roses. It was such a pleasure to work with Perry’s The Wedding Company and Everything’s Covered – everyone did their best to create a special and unforgettable day for this beautiful couple. Last October I had the pleasure of arranging flowers for a very lovely couple – Terri and Tim. Terri liked the woodland theme. It was perfect for an autumn wedding. We suggested going for two designs on the guest tables: tall and small arrangements. For the tall arrangements we used vases covered in moss and trailing ivy, with loose flower arrangements on top. For the low ones – we made flowers in an antique urn surrounded with “Mind your own business” plants, moss pots with hydrangeas, wooden candle holders and deco birds. I love adding extra decorations – it has the impact of making the arrangement unique. Sorry it’s been a long time since our last post. We’re crazy busy with arranging weddings and meeting new brides. Wedding floristry it’s not only making beautiful arrangements – it’s about understanding couples and making their dreams come true! 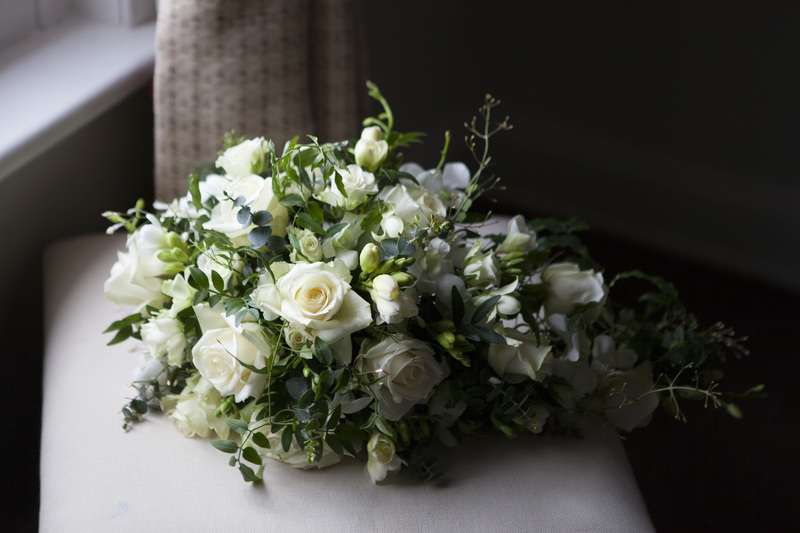 Next month we’re supplying wedding flowers to a lovely bride in Cardiff. To make her table arrangements more romantic we’re decorating all of her candle holders. So I would love to share it with you. For this job you’ll need glass candle holders – any shape, glue gun, scissors and selection of ribbons and brooches. Be creative mix and mach different shape and texture ribbons and finish it with a brooch. Can’t decide to go for a posy arrangement or a shower bouquet? Have a look at this purple and white cascading wedding bouquet we did for a lovely bride Adele.